Sign up with your first name and best email address below to get instant access to this powerful audio program! While some in the natural health field try hard to do anything but face up to their need for marketing, those who find ways to embrace it end up helping more people each and every day than those that choose to forgo it. 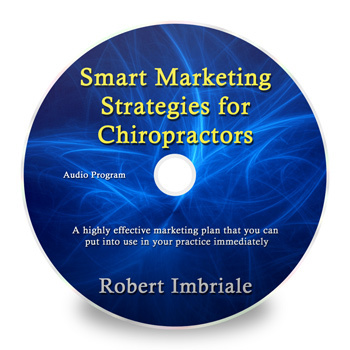 In this insightful, instantly downloadable MP3 audio, you'll hear top Marketing professional, Robert Imbriale lay out a simple, yet a highly effective marketing plan that you can put into use in your practice immediately. This no-hype, just-the-facts presentation is loaded with valuable marketing gems. You'll likely want to listen to this presentation more than once to be sure you don't miss a thing! And, because it's an MP3 audio file, you can add it to your iTunes library, burn it on a CD and take it with you in the car. Or simply sync it to your iPod, iPhone, or iPad and listen wherever you go!